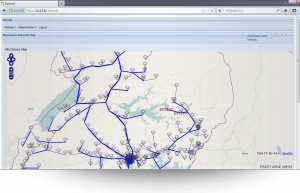 nomad’s Network auto-discovery, synchronization, topology representation and complete consolidated network inventory for Transport networks is the foundation for Service Assurance and enables network managers to achieve and maintain an accurate network picture. The accuracy of network data in inventory is crucial. When complete and up-to-date it gives network engineers and manager visibility of the network and the understanding and direction for decisions and investment. nomad Network Inventory has proved successful in a number of customer cases where other network data collection tools have proved unsuccessful due to complexity in the network, with multi-vendor, multi-technology resources. nomad network discovery software automatically retrieves and geographically represents the network topology to provide an understanding of the layout and detail of microwave, optical and data communication networks as they exist in the physical environment. Topology discovery is automatic, meaning that no links will be missed due to human error. More importantly, it reduces the amount of time spent on gathering and inputting data in addition to time spent checking and validating the. A user-friendly interface makes it easy to select any site or link on the map and access detailed information as well as navigate from the map to the inventory and performance data. An end-to-end view of the network is given so that the complete network data is stored and represented in one place. For microwave networks, full link inventory is collected and displayed in a report for the whole network. The report provides the full complement of parameters such as near-end and far-end location and coordinates, Network Element Type, Transmit Frequency, Frequency Band, Shifter, Modulation and Protection Scheme, with the ability to filter and search for specific equipment, location, frequencies etc. for quick access to data. 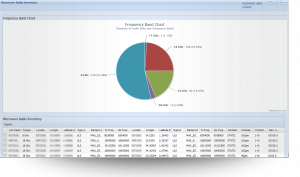 Having the complete data to hand empowers managers to optimize their resource allocation, now that they hold information about where frequency can be re-allocated or where legacy links can be re-allocated. In addition to cost savings arising from optimized resource allocations, time savings exist due to the fact that all inventory information is in 1 place, easy to access and automatically updated. For microwave and optical networks, the full equipment inventory is collected and displayed in a variety of reports including Managed Element Type, Board Type, ODUs and Element Licenses. These reports contain data about the part numbers, serial numbers, software release numbers and capacity license, and all that is needed to archive, maintain and manage inventory. For network managers this brings a consolidated equipment inventory where it is easy to find equipment, track licenses and make changes in the network, without having to first open the equipment view. Accessing data quickly using search and filter functions brings savings in operations and troubleshooting while Detection Date and Item Management features extend the power of the software. Accurately represent network resources. Get individual reports for Managed Element Types, Boards, Outdoor Units (ODUs), Locations and Parts. A new Synchronization feature brings together a number of sources to ensure the entire network and its elements are 100% synchronized, essential for operations. This includes a Synchronization Status Report for all managed elements, port-based parameters such as Synch-E mode and a Synchronization tree, providing a clear picture of synchronization across the whole network and enabling network engineers to efficiently configure and troubleshoot the network where synchronization is concerned. nomad is capable of discovering and retrieving data communication network (DCN) inventory. For all the elements in the network it returns the IP address and net-mask of all management interfaces, the OSPF areas, the in-band/out-band configuration and more. DCN configuration file can be exported in nomad’s DCN Design Wizard module for analysis, validation and design. Network Inventory Management is the cornerstone of nomad OSS, allowing operators and manager to take full advantage of other nomad modules to optimize the network and reduce operating cost.